A variety of snow cone flavors. Do those little snow cone shacks, push carts, or trucks make any real money? It’s a legitimate question and can be easy to dismiss the revenue potential of a shaved ice if you’ve seen a little push cart at a fair or farmer’s market. But if you take a deeper look, you’ll discover that shaved ice is actually a profitable little niche market. In this post, we will break out some different scenarios and factors that go into determining the annual profits of a shaved ice business. We will also outline some of the variable expenses of operating different models of this business. Note: For the purposes of this article we are using the word shaved ice or snow cone interchangibly. There are some small differences between the two depending on where you live, but to the layman these are usually interchangable. First, let’s look at some examples of shaved ice businesses that have reported gross revenue numbers publically to get a sense of the overall potential of operating a shaved ice business. 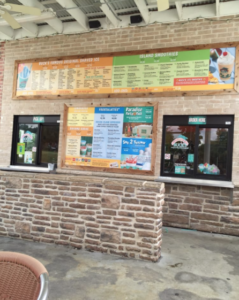 Bahama Buck’s refer to themselves as the Original Shaved Ice Company. They are a franchise opportunity with locations in many parts of the United States including California, Nevada, Texas, and many others. While this franchise diversifies their product offerings to include coffee and smoothies, the core product offering is shaved ice. According to the franchise disclosure document for Bahama Buck’s, a document required and reviewed by the Federal Trade Commission, average gross sales was $463,387 annually in 2015. The top 25% of franchisee’s generated reported over $650,000 in top line revenue. That’s a lot of shaved ice! Another shaved ice business franchise is Kona Ice. In 2015, there were 594 Kona Ice franchises in America and the number has continued to grow since then. On average, Kona Ice units will generate an average of $94,868 per unit in 2015. Of course with Kona Ice, it is not uncommon for frachisee’s to own multiple vehicles, which increases the average annual income. Also, unlike stationary restaurant locations, most Kona Ice trucks do not operate as frequently and some are only open part of the year so this is not exactly an apples to apples comparision. Of course there are success stories from other shaved ice business owners as well that are not part of a franchise. Check out this podcast interview with Snowy Joey based out of Australia. This business was started by a high schooler and has since gone on to generate over one million dollars in revenue. Not bad for a business that started out being operate on weekends only with a used shave ice machine. As you can see from the examples above the sky really is the limit in terms of revenue potential in this industry. It all depends on how much you want to work, how hard you work, and how well you execute. The model is already proven and you can build a large and profitable business serving this product. You just need to have the execution and marketing down! Of course many shaved ice businesses don’t generate anywhere near 6 figures in top line revenue annually. And that’s okay! Many people start selling shaved ice as a way to make a little extra money on weekend or during the warmer summer months. In these situations, a business may only generate between $500 – $1,000 total. The nice aspect of this, however, is that you can still pay off the cost of buying shaved ice equipment, syrups, and other supplies within just a few months of operating a business at this level. The other thing to keep in mind is that even if you start out by having a part-time shaved ice business that only operates on weekends or holidays, it doesn’t mean you need to operate as a small business forever. As mentioned in this interview, Snowy Joey operated for years as a small business before getting serious about their business and expanding into multiple shaved ice units. To date, they own a business in full that has generated over one million dollars in sales. One handy dandy tool available for free is the potential earnings calculator from Snowie.com. This tool lets you make estimates about how profitably your snow cone business might be. Another nice element of this tool is that it estimates your expenses for operating the business as well, including things like syrups, spoons, ice, cups, insurance and rental space that you will need to cover. Stationary Location – A stationary or brick-and-mortor location will require the most overhead of any business model for selling snow cones. There’s monthly rent, electricity, labor and other costs associated with running a storefront. With that being said this model usually offers the best opportunity to generate the most top line revenue as well since you’re always in a fixed location and are open a consistent number of hours each month. Monthly Rent $500 – $3000 Variable cost depending on location. Shaved Ice Machine $1,000 – $2,000 One Time Expense. Permits and Licenses $100 – $500 Varies a lot depending on where you operate. Register / POS $50 – $1,000 Can also use an iPad and an app for credit transactions. Cups $80.00 Approx. 2,000 per Month at $0.04 per cup. Ice $260 Approx. 2,000 per Month at $0.13 per sale. Napkins $20 Approx. 2,000 per Month at $0.01 per sale. Labor $3,600 Assumes $10 per hour for one employee. 12 Hours per day for 30 days per month. Note: These costs above assume you will sell about 67 units of shaved ice per day (about 2000 sales monthly or 30 day time period) over the course of an 11 hour work day. These are conservative sales numbers for research purposes only. Everyone’s situation will be different and sales could be much higher or lower depending on your marketing and location. Shaved Ice Machine $1,000 – $6,000 This will vary greatly depending on the quality of shaver you purchase. New or used. Signage $2,000 – $25,000 Variable expense. Employee Uniforms $500 – $1000 This will vary a lot. Freezers for Ice $2,000 – $10,000 Variable expense. Syrup Display Setup $5,000 – $25,000 Variable expense. *All revenue numbers assume $3.00 average per sale. If you plan to operate a mobile unit to sell your shaved ice, the costs are much the same with the exception of monthly rent. This is an expense that can be largely removed from the expense column unless you plan to pay to vending fees at certain special events in your area. One additional one-time expense that you will need to include into your business plan figures is the cost of acquiring a shaved ice trailer, truck, or step van. The cost of these can range anywhere from about $15,000 – $100,000 in price depending on whether you want a truck versus trailer, used or new vehicle, and what type of fancy customizations you would like on the vehicle. The other added expense you’ll need to take into account here is gasoline and regular maintenance of a vehicle. This is a mobile unit and will require some tender loving care if you want it to operate and generate revenue for your business long term. Cost of Vehicle $15000 – $100K Variable cost depending on vehicle. One time investment. Gasoline $50 – $500 Monthly Variable Expense. Maintenance $0 – $500 Oil changes, repairs to vehicle, etc. Buying a little push-cart or having a pop-up stand is the lowest cost way to start a shaved ice business. You can literally get everything you need from equipment, to supplies, or permits for under $5,000 in initial investment, which is incredible. Since the cost to entry is so low it also enables you to recoup the investment quickly, often times within just a few months of operating the business part time. From there you can either expand the business, by purchasing more shaved ice machines and equipment or simply keep the additional cash to create a better life for yourself. Best all, by starting out with a simple pop-up stand you can vend at many of the same places that food trucks are invited like festivals, special events, farmer’s markets, and more. This is also a great way to “test out” if you like running this type of business without any big financial risk. Push Cart / Popup / Kiosk $2,000 – $20,000 Variable cost depending on your selection. One time investment. As you can see from the examples above the low-cost of the shaved ice product makes it very appealing as a product owner. The ice, syrups, and cups are an extremely small portion of the overall costs and will typically be under 10% cost of the final sales price to customers. Using the figures above it will cost you roughly 20 cents to provide a cup of shaved ice to your customer. At an average cost per cup of $3.00 you’ll be pocketing $2.80 per sale, which is an incredibly healthy margin that other food vendors will be envious of. Most traditional restaurants are happy to generate 33% profit of margin from each sale while you’re operating at over 90% profit per sale! 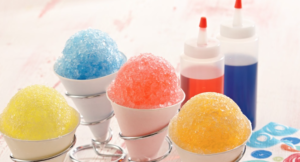 Although the margins on a snow cone are exceptional there are two variable costs that can prevent you from realizes your businesses profit potential. The first is rent. If you have the overhead of an expensive space, you’ll need to sell a lot more product on a consistent basis to break even. If you have a higher rent with a high volume of traffic the monthly payments can be 100% worth the investment so make sure to do you due diligence before signing papers on a 12-month rental agreement. The second big cost that can get out of control is labor. If you are planning to run the business initially you can completely wipe this expense off of your books and it will make running a profitable stand a no brainer. If you decide to go out and operate the business, you will make money and be profitable. There are a couple variables that will determine your labor expenses. First, is where you plan operate the business geographically. If you operate the shaved ice stand in some parts of California you may need to pay $12.00 an hour for a trustworthy employee. If you live in rural Tennessee, you may only need to pay $8.00 an hour. You can also help employees supplement their hourly wage by putting out a tip jar. At the end of the day, monitoring labor expenses is going to be one of the critical parts of operating this business if you want to grow and make real money from this venture. We hope you enjoyed this post! Stay tuned as we will be publishing more content to help you start your own shaved ice business very soon!